The Campus Gift and Bookstore sells required textbooks for courses at College of the Siskiyous. The Bookstore is also your on-campus destination for school supplies, snacks, gifts, and College of the Siskiyous clothing and souvenirs. The Campus Gift and Bookstore will be holding a Textbook Buyback Event May 16-17 and 20-24 in the Weed Campus Bookstore and the Yreka Main Office. The online Marketplace is provided as an online bulletin board platform. Customers can post items for sale under their own terms and pricing or purchase items such as textbooks. Pricing, sales, and interactions take place between the buyer and the seller only. An account must be created to participate within the Marketplace. 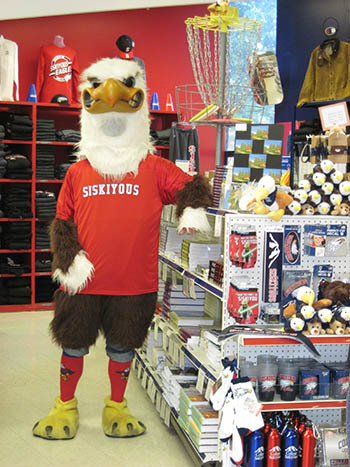 College of the Siskiyous Bookstore is not involved in the process of buying or selling any products within the Marketplace. The Marketplace is simply a bulletin board for customer-to-customer interactions. College of the Siskiyous will not be responsible for any issues or transactions within the Marketplace. A receipt is required to process a return for a textbook. New books must be in new condition with no marking, writing, or highlighting with all pages intact. Books purchased in shrink wrap must be returned as such. If paying by check, you must have proof the check has cleared the bank in order to receive a refund. Clothing may be exchanged for a store credit if the garment is still in new condition within 2 weeks of the date of purchase. Students can now purchase Microsoft Office Professional Plus software for $39.99 - available exclusively through CollegeBuys for California Community College students. This price, negotiated by CollegeBuys on behalf of our system, is the lowest offered anywhere for our students.